It’s been a great few days for trailer releases. There were three for movies that I’m excited about and one that I’m kinda so-so on, but the trailer has me leaning more toward the yes column. This is a Disney film from team that brought your Pirates of the Caribbean. Some of the early word on the film indicated it was going to be a somewhat off-beat take on the franchise, but I’m happy to say that this isn’t the case. It’s a full relaunch of the legend. The biggest concern I have is how will Johnny Depp’s take on Tonto play out. There appear to have been a few questionable creative choices, but we really won’t know until we see the entire movie. I definitely intended to do that. I’ve written more on The Lone Ranger over on The Disney Blog. 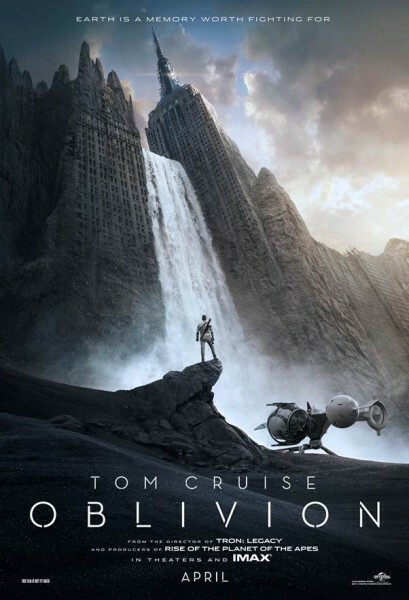 Tom Cruise shares the screen in Oblivion with Morgan Freeman where on a future Earth that has evolved beyond recognition, one man’s confrontation with the past will lead him on a journey of redemption and discovery as he battles to save mankind. Oblivion was shot in stunning digital 4K resolution on location across the United States and Iceland. The production value is insane, let’s just hope the story matches up. Look for it in April 2013. This is is another future vision of Earth. It stars Will Smith and his real life son Jaden who crash land and have to survive in a very hostile enviromnent. It has definite Pandora overtones and appears to be a hand-off vehicle with Will passsing along his action movie cred to his son. This is the one I’m not so sure of. Can we really trust M. Knight Shyamalan to direct a decent film? Normally, I’m not a big fan of these sorts of ‘scare you’ movies, but if there is more of a science fiction angle ior a good ‘ah-ha’ moment, I might go see it. Btw, does anyone else think that Jaden is realy a clone of Will? They look amazingly alike. Watch for After Earth on June 7th, 2013. Finally, we return to the comic book superhero genre with an updated take on Superman. Henry Cavill plays Superman with a bit of a darker background as befits a super hero who comes to age in the modern world. Director Zack Snyder hopes he can do for Superman what Christopher Nolan has done for Batman. I hope so too. I’m definitely not one of those who say Superman shouldn’t be dark… please, go there, I say. But be sure to bring us back out the other side too. This second trailer has more back story, but also tantelizing glimpses of the rest of the story and people who will popular Clark Kent’s world. Man of Steel will hit theatres June 14th, just one week after After Earth, which might be an interesting box office battle. Just kidding, Superman will slay the Smiths with one glance. Which of these four films are you most looking forward to? Which do you think will end its run with the largest share of the 2013 box office?